As many of you know, I’ve gone “hybrid,” which means I am independently publishing some books, writing some for a small press and continuing to write for Harlequin. This has completely spoiled me, because when I indie publish, the choice of what goes on my cover is entirely up to me. 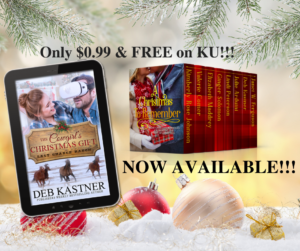 For example, my novella A Cowgirl’s Christmas Gift, which is currently in the boxed set A Christmas to Remember with other Inspy Romance authors, has my adorable geek hero on the cover, VR glasses and all. Will it sell? Hard to say. But Cam was a bucket-list hero for me and I wanted to depict him as he really is (plus, that’s how he looks when heroine Maisey first meets him). I really wanted a kitty in this beautiful Christmas scene. And not just ANY kitty, but Maus, who takes this rugged cowboy and softens his heart so he can learn what it means to open his heart and love the heroine and baby. I get that covers can get too cluttered, but I sure wish they’d found room for little Maus. But since they didn’t, I thought I’d share him here. I can’t believe Christmas is just around the corner. 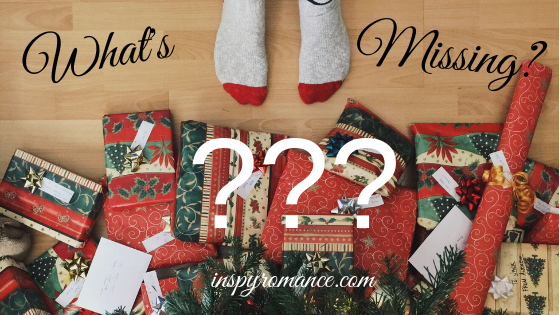 Are you starting to prepare for the holidays or are you, like me, hanging onto fall for just a little bit longer? 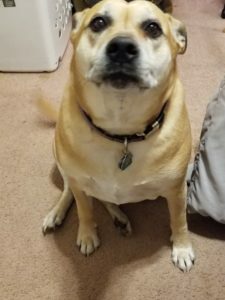 I write about pets a lot because, well, I love ’em! And I’d love to hear about your pets. My Gabby simply delights my heart, as does my “big dog” Sadie. Tell me who brings a smile to your day! Gabriella (Gabby), our little angel. 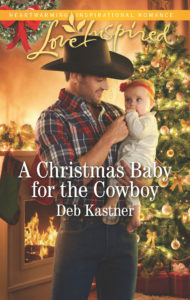 Hi Deb, I love the cover of A Cowgirl’s Christmas Gift! Before reading posts on this blog, I never realised how little say authors get over their covers with traditional publishing. We don’t start decorating for Christmas until after school finishes for the year- mid December here in Australia. Then we put the tree up and start thinking about any other decorations. With Christmas in Summer, putting lights on houses doesn’t make much sense as it is not fully dark until nearly 10pm, so if you want to see the lights, you have to be out late- not great with young ones!!! I’d never really thought about outdoor Christmas having little use in the southern hemisphere! I never thought about Christmas being in the middle of summer there. I’ll bet that could make for some interesting stories! Hey, Deb! Thanks for sharing the details of your book cover journey! Currently our household is pet free….and we do not put up the first Christmas decoration until Friday after Thanksgiving! Hubs works retail….so you can just imagine his day…. I stay home and decorate! Hi Deb! I enjoyed reading A Cowgirl’s Christmas Gift in the boxed set A Christmas to Remember. Since my husband and sons love technology, computers and gaming, the cover caught my attention. Maus is precious and love the German spelling of his adorable name. Seeing pets this holiday season, makes me miss mine since after 40 years we are empty nesters (no kids or fur babies living at home). At our age not sure it is fair to have another pet, have seen the stories of older pets being sent to shelters when their owners pass. Still see our beloved 16 year old deaf Sheltie Penny at ever turn and miss her warm barking greeting when we come home. Hard to believe she has been gone almost three months now. Breaks my heart when our 22 month old granddaughter asks for “Pen-KNEE.” We tell her she is running free in heaven. Holiday decorations go up at first Advent, which is December 2. First the Advent wreath and calendar, then a small tree after St. Nikolaus Day on December 6. As Oma, I decorate with children in mind with a small Santa village and a Nativity set, plus lots of holiday stuffed bears and our beloved Elf Bella. I decorate for the kids, as well. My daughter married a German (like…literally from Germany) so we’ve learned about some new traditions which are great fun. Deb, I am literally from Germany. I was born in Berlin, as was my father, and can trace my family back five generations. My mother grew up in East Prussia. My great uncle came to the states in 1914 and we came in 1955. Still have cousins and their families that live in Berlin or southern Germany. I don’t have any pets! I haven’t had a pet in decades. We had a few dogs and lots of cats as pets while I was growing up. I love animals and I admire others’ pets. I’m just so busy that a pet is another responsibility that I don’t want right now. I might reconsider if I’m ever able to write full time as I wish. Having a day job kind of puts a damper on my wanting to get a pet. I can’t imagine not having dogs. Way to much of a pet person. But I totally understand how difficult they might be with a day job. If you ever do start writing full time, you may decide a pet is the perfect companion! I think most of the time these days I prefer the indie covers. The publishers find a formula and the do it to death. I like something that stands out and has curb appeal. Three pets reside in our home. Brody is a 10-year-old Black Lab cross (crossed with who knows what, frankly, as he’s huge!). We have two calicos, littermate sisters who are nine., Coonie and Moxie. They have vastly different purrsonalities. 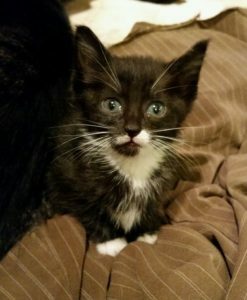 I don’t always include pets in stories, but Brody makes an appearance in The Cowboy’s Mixed-Up Matchmaker as James’s dog, while veterinarian Lauren comes home to a tuxedo cat named Felix. 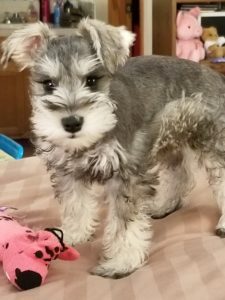 Many of my sister’s animals show up in my books, and my next two books for small publishers will have lots of animals–a veterinarian hero in the first and a celebrity dog trainer heroine in the second. Maus is too cute. I think he should have been on the cover too. But I guess they didn’t want to take away from the baby. Our little furbaby is a 40-lb, 7 year old terrier mix named Boo that everyone says is more spoiled than our two girls. They agree but when they went to college they cried about leaving her not us. The video call the Boo frequently. Oh I just adore cats and kittens! I’d have a house full if I could. We have rescued a few and they make such wonderful pets. We also have a dachshund dog that has an attitude and keeps us on our toes! I was born loving cats :-) When I was 3, I started asking for a cat for Christmas, and was indignant when my parents gave me a stuffed one. My husband and I now have 2 elderly cats. I loved the picture of Maus!